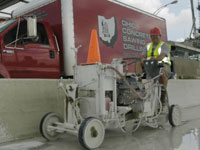 Specialized equipment for making tapered cuts and removal of curbs. Horizontal curb cuts allow for installations of new driveways, approaches, and handicap ramps. Our custom-built saws allow us to effectively open the curb so you can gain access. The saw cuts curbs horizontally to the street from the street side without requiring a large amount of excavation on the back side. A new residential approach can be cut in less than one hour and includes tapered cuts on the ends. Please check with your local jurisdictions to see if curb cutting is an acceptable form of curb construction. In addition, there are several requirements needed from your municipality for the dimensions. There are a few municipalities that prefer a complete removal of the curb, followed by a repour of the shaped entry. We can help you meet either requirement.